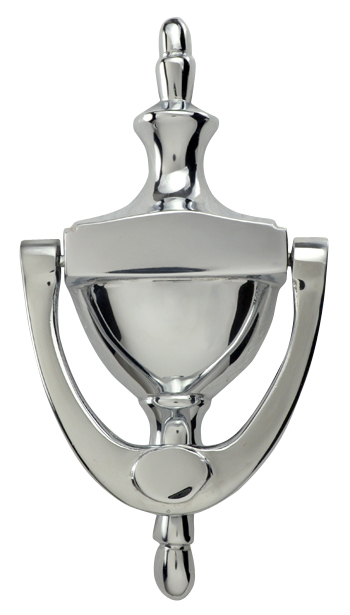 6 Inch (4 Inch c-c) Heritage Style Door Knocker (Polished Chrome Finish) - measures 6 inches tall and 3 inches wide and has a projection of 1 inch. This mounts with two bolts (included) with center-to-center mounting distance of 4 inches. This is made for a maximum door thickness of 1 3/4 inches. Comes complete with the mounting hardware. Available in many finishes including, polished brass, antique brass, oil rubbed bronze, polished chrome(shown), and polished nickel.